It’s a beautiful Fall day, and the weather has finally cooled down enough to start doing some comfort food. I’m not a fan of cooking cool weather foods when it’s still summer outside, even if it’s the end of September, but by the time I start seriously considering hanging the glow-in-the dark skeleton by the front door, I know it’s time. Today’s post is inspired by the restaurant, Sebillon Elysee, in Paris. They are famous for their Allaiton de L’Aveyron gigot d’agneau (leg of lamb), which is wheeled out on a cart and carved tableside. 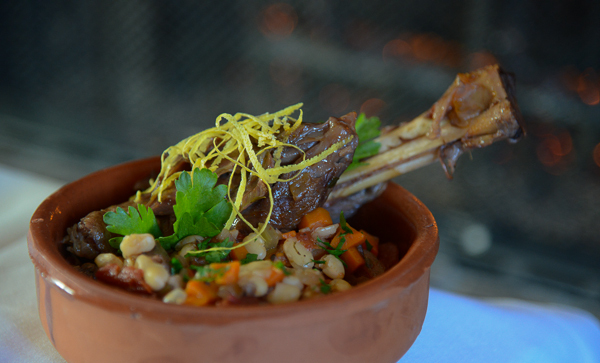 It’s served over creamy white beans that come to the table bubbling away in a copper pot. This century-old restaurant is one of my favorites in Paris; very old-world style without being stuffy. I had never even heard of braising until I went to culinary school. Coq au Vin was the first braised dish I made, and I fell in love with it and the technique. Braising is the combination of searing food at a high temperature then cooking it in a liquid in a covered pot at a low temperature. The meat is then removed and the liquid left in the pan is reduced to make a sauce. Although braising takes some time, it’s mostly hands off, and the restaurant- quality results are worth the extra time. You end up with fork-tender meat and a luscious sauce. Anyone can braise; once you get this technique down the possibilities are endless. If you don’t like or eat beans, or you are following a Paleo or Primal program, this dish is just as good with a side of creamy mashed potatoes or some sort of vegetable puree such as cauliflower, turnips, or parsnips. I used navy beans because that was what was available, but any white bean, such as cannellini or great northern, will do. Pick over the beans and soak them for at least 3 hours (preferably, overnight). Rinse the beans and place them in a saucepan with enough water to cover them by 2 inches. Bring the beans to a boil, lower the temperature to a simmer, and cook the beans until tender, 45-60 minutes. Drain and set aside. 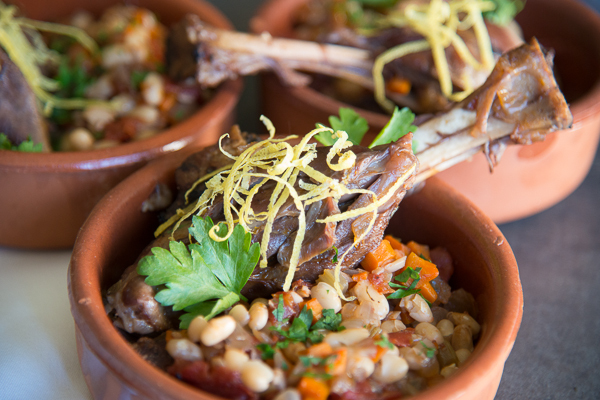 While the beans are cooking, prepare the lamb shanks. Thoroughly season the shanks with salt and pepper on all sides. In a large soup pot, warm the olive oil over medium heat. Cook the lamb shanks until brown, 10-12 minutes. Remove the shanks from the pot and set aside on a plate. Add the onion, celery, and carrots to the pot and cook until the onion softens, about 10 minutes. Add the garlic and cook for 1 minute. Add the wine, increase the heat to high, and bring to a boil. Use a stiff spatula to scrape up any brown bits from the bottom of the pot. Add the stock, tomatoes, tomato paste, thyme, bay leaf and lamb shanks with any juices from the plate. Return the contents of the pot to a boil, lower the heat to simmer, cover the pot, and cook for 1 1/2-2 hours. The meat should be very tender and falling off the bone. Remove the shanks from the pot and keep warm. Bring the pot contents to a boil and reduce to sauce consistency, about 15 minutes. Lower the heat, add the beans to the pot and cook on medium to warm the beans, about 15 minutes. Discard the bay leaf and season the beans with salt and pepper to taste. 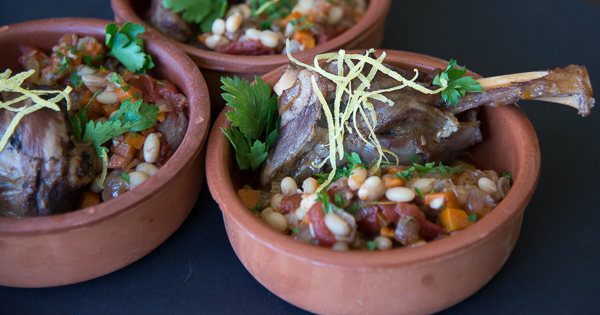 To serve, place a spoonful of the beans on a plate or bowl and top with a lamb shank. Garnish with lemon and parsley. 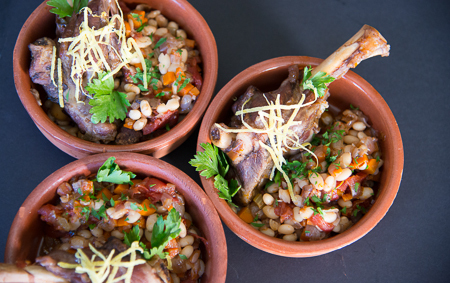 This entry was posted in Lamb, Main Dishes and tagged Autumn, beans, Fall, French, Lamb, lamb shanks, Paleo, Paris, Primal, Shanks, stew, white beans by Jeannine. Bookmark the permalink.